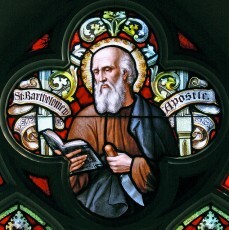 St. Bartholomew was one of the Twelve Apostles. He was mentioned in the Gospel (Matthew 10:3, Mark 3:18, Luke 6:14) as being number Six in the lists of Apostles, and seventh in the list of Apostles in Acts 1:13. Bartholomew was of Hebrew descent. Outside of the above mention verses, Bartholomew is not mentioned in the New Testament. All that is known of him with certainty is that he is mentioned in the synoptic Gospels and Acts as one of the Twelve Apostles. His name means “son of Tolomai”, and scholars believe he is the same as Nathanael mentioned in John, who says he is from Cana and that Jesus called him an “Israelite…incapable of deceit”. The Roman Martyrology says he preached in India and Greater Armenia. Other traditions represent St. Bartholomew as preaching in Mesopotamia, Persia, Egypt, Armenia, Lycaonia, Phrygia, and on the shores of the Black Sea. Tradition has it that he died in the place known as Abanoplis on the west coast of the Caspian Sea. Some accounts say he was flayed alive, and crucified, head downward, by order of Astyages, for having converted his brother Polymius, King of Armenia. Michelangelo’s Last Judgment shows him as being flayed, and holding in his hand his own skin. His relics are thought by some to be preserved in the Church of St. Bartholomew in Rome. He feast day is celebrated on August 24th. The life of St. Bartholomew is one of much suffering. He was one of the Twelve Apostles of Jesus, and had the joy of being with Jesus in the physical sense. But, once Jesus Ascended into Heaven, St. Bartholomew went to many parts of the world to preach the Gospels and tell the early Christians, firsthand, of our savior Jesus. This life was one that would cost him his own, but he never wavered in his loyalty to Jesus, preaching the good new right up to his own martyrdom. As many of the Apostles suffered severely, so we could have the Catholic Faith that we have today, we should do all in our power to learn that Faith, and put it into practice. Think of the difference you and I can make, if we all reach out to one person, and teach them the Faith that St. Bartholomew so readily died for. We could change the world.